AEI SECURITY SG400M AUTO-DIALER GSM BASED. IDEAL OUT OF THE WAY FOR SECURITY. Carbon Monoxide Alarm by Kidde - 7 Year Warranty Uses 3x AA batteries (supplied) Ideal for home or to take with you on holiday. 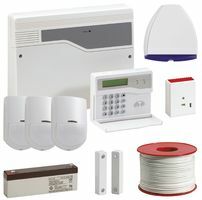 The Sonic Shock 5 Full kit includes everything you need to install and operate a Sonic Shock 5 alarm – the alarm module and sensor tether, base plate, glue and two keys. You don't need tools.